Tonight we finished off the last of the chipotle squash soup. Bruce made a salad and I made a super Hot Chipotle Jalapeno Shrimp. I was tired of wimpy bland cooking so I added jalapenos. Finally, some hot food. Today I worked on my chipotle site. I may post it on line. I've decided that I will have to get Everyday Mexican Cooking by Rick Bayless, the Chicago Chef and owner of Frontera Grill in Chicago. Meanwhile I've been adding some of his recipes to the site. Of late, we've had chipotle in every dish at every meal (not counting breakfast). Tonight I made a cilantro chipotle pesto with a bunch of cilantro, olive oil, lime juice, and chipotles. It was poured over haddock and sautéed zucchini, mushrooms, onions, garlic and red pepper. It was very good. For soup we had Chipotle Gazpacho. Monday we had sautéed zucchini, mushrooms, onions with cilantro chipotle pesto w/ goat cheese, Chipotle Gazpacho and Butternut Squash Chipotle Cauliflower Soup. Yes, believe it or not, that is very good. Addicted to Subway's Southwest Chipotle sauce, I was determined to have that wonderful hot spicy taste in my home cooking. Last Sunday, I went on an outing to Barnes and Noble with my friend Dianne. We sit for hours in facing armchairs reading cook books and chatting and laughing. 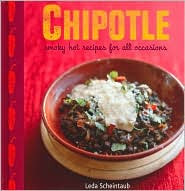 When I discovered Leda Scheintaub's Chipotle: Smokey Hot Recipes for all Occasions it immediately came home with me. Such a delight. 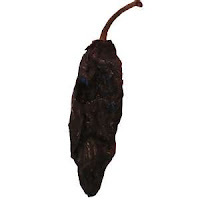 Over 40 recipes with chipotles. It started with Subway's Southwest Chipotle sauce. I wanted to buy a gallon, but it's not for sale and the recipe's secret. I couldn't duplicate it and Kraft discontinued their chipotle sandwich sauce. Meanwhile, I was adding Chipotle chili powder to everything. Then, my newest cook book Chipotle: Smokey Hot Recipes for all Occasions by Leda Scheintaub inspired me to add a new phase to my life, a passion for Chipotles. So, now, it is everything Chipotle: books, spices, soups, grills, videos, desserts ?